With its classic, simple elegance, this handcrafted, Western style dresser will provide beauty and practicality to your home décor. The dresser features six, rectangular drawers, and centered in each drawer is a hand forged, iron, pull handle. The dresser has an open, wide top, with a classic, straight top rim. Each side of the dresser is adorned with a decorative, geometric cut panel, and it rest on four, brief, strong feet. 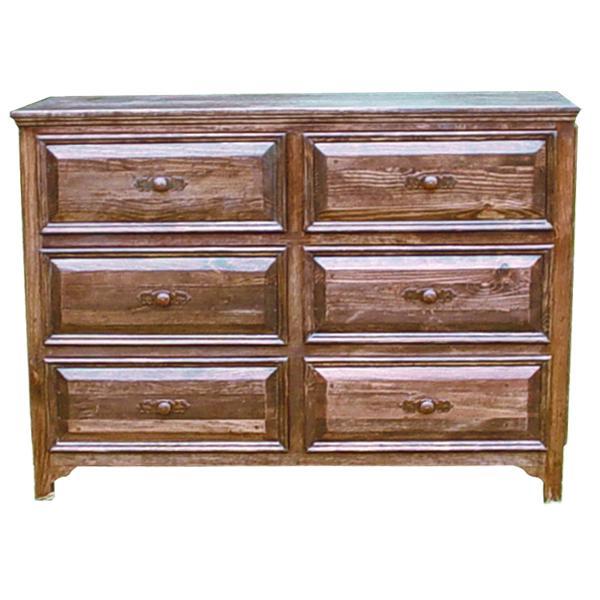 The dresser is finished with an antique, brown stain, and it is made with the best, sustainable, solid wood available. It is 100% customizable.